Thousands of tourists are still stranded by the volcanic ash crisis in Europe. 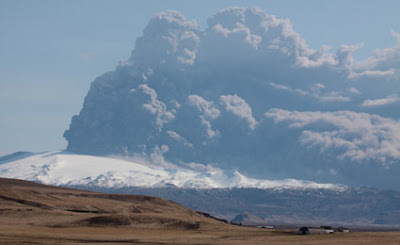 A week of airspace closures caused by ash cloud from Iceland's Eyjafjallajokull volcano has caused the worst breakdown in civil aviation in Europe since World War II, with around 100,000 flights cancelled. The volcano is said to be pumping between 150,000 and 300,000 tonnes of carbon dioxide a day into the atmosphere, but the crisis may still be reducing overall greenhouse gases by grounding planes, which emit CO2. 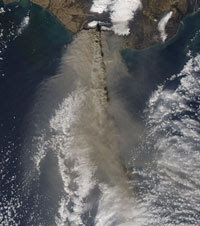 The photo above left is an aerial satellite photo from NASA. And to see some more fantastic photography from the volcano check out this great collection at www.boston.com.